UPSCALE OCEANFRONT UNIT in Architectural Landmark, Harbor Court! 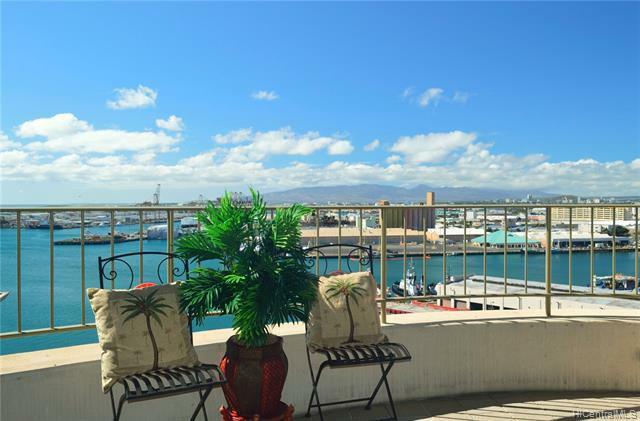 Stunning pacific ocean & sunset views from 142 sq ft spacious lanai and each room overlooking Honolulu Harbor & Iconic Aloha Tower! Enjoy luxurious living and "OFFICE USE" in central downtown financial district. Walk/bike to work, shopping, theaters and restaurants. Amenities include saltwater infinity swimming pool, fitness center, barbecue & recreational area. One owner, well maintained, renovated with new laminate floor, paint and ceiling fans. READY FOR IMMEDIATE OCCUPANCY. UNBEATABLE PRICE! !